▲ The illustration of "feminism for all"
Recently, interest in feminism is hot in Korean society. In 2016, there was a murder case in Gangnam Station, a person was killed just because she was a woman. In 2018, female prosecutors were accused of sexual abuse in the prosecutors' office, and there was the ‘Me Too movement’ that spread to culture, politics, and academia. MEGALIA and WOMAD activists are working on an extreme radical movement online that promotes masculinity and female supremacy. These events and phenomena are the main factors that ignited the feminist debate in Korean society in recent years. The background, purpose, and aspects of each event and phenomenon are different. However, one thing in common is that Korean women began to actively and collectively utter the repression and exploitation of everyday life. And it seems that there has never been a lot of active and controversial arguments for feminism in Korean history. To be precise, female aversion, feminism aversion, and gender conflict are maximizing. Aversion to feminism is also a result of political beliefs and perceptions that have formed in the experience and dominant culture of each person's life affected by the social structure. But in many cases, it comes from the ignorance or misunderstanding of feminism. One of the main misconceptions about feminism is that feminism is the idea of claiming women's interests. Like all ideas, feminism has a history that reflects the current situation of the times. The etymology of feminism comes from Latin, ‘femina’, which means women. The term feminism was first used by the French fanciful socialist Charles Fourier in the mid-nineteenth century. At that time, western women in society did not have the right to education, suffrage, and property rights. In other words, women were not qualified as political citizens, and economic and social activities were not free. In addition, women had to live a life that was subservient to men without living an independent life. This situation led women to argue that women should have the same rights as men, politically, economically, and socially. These beliefs and claims are called feminism. In the mid-nineteenth century, feminism was to add equality and justice omitted in the theory of natural rights, which was the foundation of the civil revolution. Since then, feminism has been variously adapted according to the situation of the times and requests and the discriminatory situation of women. Poor women and some intellectual women thought that the capitalist structure was the cause of women's oppression and discrimination. So they participated in the socialist revolutionary movement. In the 20th century, various civil rights movements spread with the fall of the socialist power and the 1968 revolution. Along with this trend, feminism entered a new phase. Women's entry into the public sphere increased, but women still have to work in harsh working conditions. And women had to be dedicated to housework and parenting. Therefore, feminists have criticized women's discrimination and gender division in the labor market. And raised the issue of free labor and undervaluation of housework and childcare. Other feminists demanded the right to an abortion, the demand for childcare facilities, and the right to be safe from sexual harassment and sexual violence. In other words, they wanted to improve the culture of everyday life related to the body and sexuality. Feminism in the 20th century was also intended to correct discrimination and unequal treatment of women who were missing in the process of social and cultural transformation. Thus, feminism is a process of revolution with history and variability. Thus, feminism is not single or fixed. Feminism is ‘feminisms’ that questions, analyzes and resolves past history and current women's lives. The range of issues covered by feminism is bound to be broad. Discrimination in sexual harassment, sexual violence, domestic violence, childbirth, parenting, housework and care work, employment, wages and promotion, the problem of differential representation in the mass media and the arts, the problem of unequal and violent relations in the world of love, friendship and family, the problem of sexual desires and various needs, the problems of choosing a spouse, and so on... Our life itself is a question of the relationship between men, women, and other sexes and it is the stage of feminism. So feminism is not just about dealing with women’s problems alone or promoting women’s rights. Feminism is not for women only, but for all. Feminism is a movement and practice to create an equal and democratic society and culture. Recent feminism not only seeks discrimination against women, but also the hierarchy within men and women. It also seeks solidarity with oppressed men and social minorities. 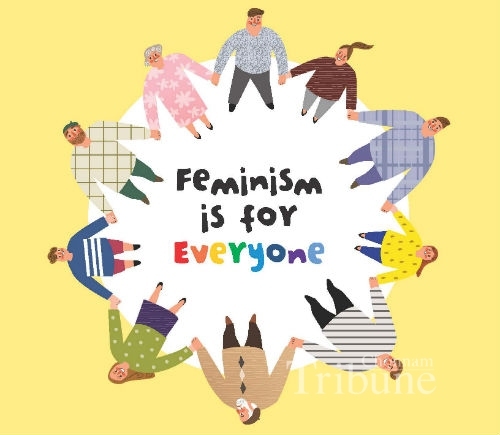 In addition, feminism focuses not only on gender but also on the issue of complex discrimination and differences based on race, class, sexual identity, generation, disability, and so on. In conclusion, feminism has started from finding women's rights, but has tried to change the whole social structure and culture into the direction of equality, justice and progress. In addition, feminism begins with building sisterhood among women and seeks solidarity with minority male and social minorities.